Hospital Phone Systems - Move to the Cloud | 8x8, Inc. Hospitals have three main options when it comes to hospital phone systems: internal PBX, internal IP-PBX or an external cloud-based system. There are trade-offs to each but the current trend is moving toward cloud-based hosted hospital phone systems. Internal PBX: This is the traditional hospital phone system. An internal phone system is called a PBX or private branch exchange. 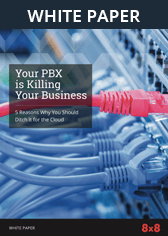 A PBX is a closed, local system. Meaning, the entire phone system is installed on-site. This is a costly operation in both installation and expansion. As new phones are added, cost increase. The system is fairly complex as well and will usually require an experienced technician to do any expansions. An advantage to this system is that the hospital has complete control and doesn't depend on external providers except for the public phone system. IP-PBX: Sitting between the traditional PBX and cloud, hosted phone systems is the IP-PBX. It is similar to the traditional PBX but improves upon it. An IP-PBX stands for Internet protocol PBX. This means a software component has been added to the phone system. An IP-PBX will often have a server on site to handle phone operations. The advantages over a traditional PBX are that voicemails can now go to email inboxes, faxes can be converted to PDFs and video conferencing is an option. Additionally, off-site employees can plug into the system securely and have full access to the phone system feature set. Because this system is hosted internally, there is a cost to maintaining it but these costs are lower than a traditional PBX because less hardware involved. Cloud-Based Phone System: Hospitals are realizing the advantages of a completely hosted phone system. Hosted or closed-based phone systems remove much of the maintenance and hardware involved with a PBX. This greatly reduces cost. Even though the system is not hosted internally, security is not compromised. Modern cloud phone systems utilize the latest security software, hardware, and best practices. In many cases, cloud phone systems are more secure than a PBX because of improved hardware and software. As technology improves, it replaces older ways of doing something. The first telephone systems in the 1800s were a chore to use and unreliable. By the 1960s, people could simply pick up the phone and dial someone else. Nowadays, virtually everyone has a mobile phone that can be used almost anywhere and for nearly anything. So it goes with phone systems. Cloud phone systems offer a rich feature set. Hospitals are motivated to upgrade from their traditional PBX systems to take advantage of these features. As noted in Becker's Health IT & CIO Report, "Cloud-based computing has already reached mass adoption levels in healthcare, and over the next couple of years, the number of providers and organizations using cloud technology is projected to triple." Cloud-based phone system providers offer different feature sets and price points. It's also important to choose a reliable phone provider with many years of experience. While cloud-based phone systems haven't been around for decades, they aren't new service offerings. An experienced provider, specializing in healthcare phone systems, should be an important part of your selection process. The selection of a cloud-based phone system provider will be time-consuming as it will involve a number of conversations. You want to be completely confident that the provider understands your existing system if you have one so that any integration can be performed successfully. The provider also needs to understand all of the features and requirements that you need for the system to function successfully.